The orange Livefree. Smokefree. wrist band can help start a lifesaving conversation about quitting smoking. Wear this band to help the American Cancer Society spread awareness about the benefits of living a healthy, smokefree life and share them with friends and family to encourage them to kick the habit. 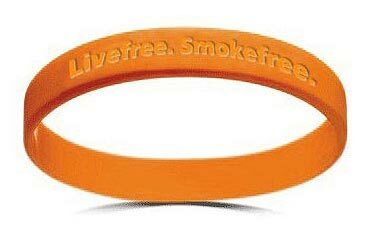 Smoking is by far the leading risk factor for lung cancer, so wear the "Livefree.Smokefree" wrist band to support those undergoing treatment for lung cancer, to honor those who have been lost, and to celebrate those who have survived. Lung cancer is the leading cause of cancer death for both men and women � more than 163,000 people will die of the disease in 2005. Join the American Cancer Society in celebrating the Great American Smokeout�s 30th Anniversary on Thursday, November 16. Make your health a priority. Find out what inspired others to kick the habit, get quit tips, and more by visiting the Great American Smokeout Web site, Livefree.Smokefree at www.cancer.org/livefreesmokefree. For more information about quitting smoking, clean indoor air, and lung cancer, as well as to view the American Cancer Society's prevention and early detection guidelines, please visit www.cancer.org.